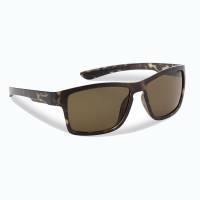 Let the sun be your spotlight in Flying Fisherman’s Tiki sunglasses. Protect your eyes from harmful UV rays without sacrificing your swagger. Versatile enough for any adventure from the water to the road, this ultra-light frame compliments virtually every face shape with timeless style and a smooth look and feel that is so simple, but yet so right! Medium fit frame with co-injected temple pads for all day comfort that will stay put and not slide. 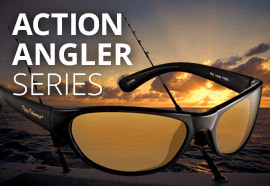 Polarized triacetate lenses are hard coated for scratch resistance, eliminate glare and reduce eye fatigue. Available in matte gray frames with smoke lenses, matte navy with smoke lenses, or matte tortoise with amber lenses. Acu Tint™ lens coloring system adds contrast without distorting natural colors, allowing you to see more clearly. One year limited warranty.